But first, I must tell you how enormously grateful I am for the many expressions of support I’ve received over the past few days. In truth I’ve been gobsmacked by them. Thank you. Your notes of encouragement have strengthened my resolve to Eat On and Report Back on this CapitalDining blog. Now, let’s go to Town! 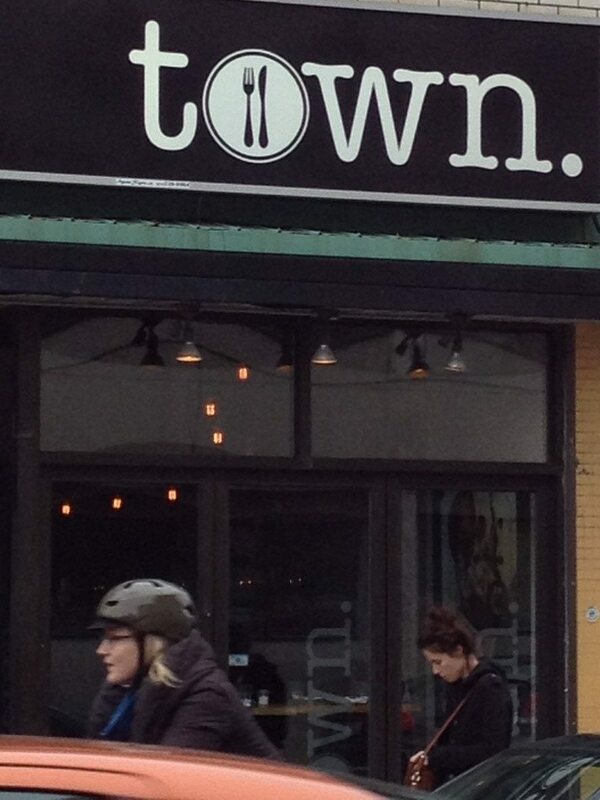 When Town opened in 2010, there were two chefs. Co-owner/Chef Marc Doiron I didn’t know. His background was in pastry, his previous work experience at the Rideau Club. But I knew and admired the cooking of young Steve Wall, who prior to joining the Town team as restaurant chef was at The Whalesbone Oyster House during and after Steve Vardy’s term. About a year after Wall left Whalesbone to go to the brand new Town, he accepted the top job in the Luxe Bistro kitchen, where you’ll find him still. So, nine months post-Wall, I wanted to know: how were things at Town? Well, they’re packed, for one. My attempts to book here have been thwarted on a few occasions. But I managed last week to snag two seats at the bar, thanks to co-owner Lori Wojcik, who, though a gracious and cheery host, inadvertedly hung up on me. Ordinarily bar seating is only for first come-first-served walk-ins. But when I called back her apology included the promise of two bar stools if I were able to come right away. So I did. And was instantly pleased to be back. Space is tight and tables are close, but this is an appealingly sociable place, at once warm and welcoming while still hip and happening – a most rare formula. I started with baloney. Whyever not? Mortadella crostini, the menu said, with a fig and onion compote, hazelnuts and an egg. I’m a sucker for figs, love fried eggs, so baloney it was. Much more appetizing when called Spuma de Mortadella, and spooned on a crostini. (Admit it: mortadella – does it not instantly transport you to the plastic-pink sandwich meat with ketchup on Wonder bread tucked in a Partridge Family lunch box? Thought so.) This was not that. This was a fabulously rich, remarkably airy, pale pink mousse on Art-is-in toast, sweetened with the onion and fig jam, and with hazelnuts for crunchy contrast and a sunny egg on top. It cost $9. I followed it with a half portion of mint cavatelli ($13) the ridged and narrow boat shaped pasta supple, tossed around slow-braised lamb, a rough chop of mint, a few meaty pistachio nuts, in a sauce rich with lamb jus and fresh, peppery ricotta. With these two dishes, for a total of 22 bucks, I was quite full. Full marks to Town for offering half portions of things. My friend, who paid her way notwithstanding how bossy I was about what she had to order, and the fact I ate most of it (bless her) started with carpaccio. This was a superb dish – I couldn’t help helping her. With preserved lemon and nubbly shavings of sharp cheese, the luscious sheets of raw meat were smeared with an arugula pesto and dotted with roasted almonds. We took advantage of a second option for a half portion of what’s become a signature dish for Town: ricotta stuffed meatballs on a wiggly polenta base, the balls moist and meaty, yet lightened with ricotta, the sauce robust. Town’s wine list is a carefully chosen collection of Canadian and Italian bottles, and includes a dozen options by the glass and a half dozen or so half bottles. After a meal of rich and refined Italian comfort food, the buttermilk panna cotta with a pink strawberry glaze made a light and refreshing way to end a night on a Town barstool. This Elgin Street restaurant remains a lively and bustling, immensely likeable place. You’ll need a booking. Or else hope you get hung up on. Worked for me.